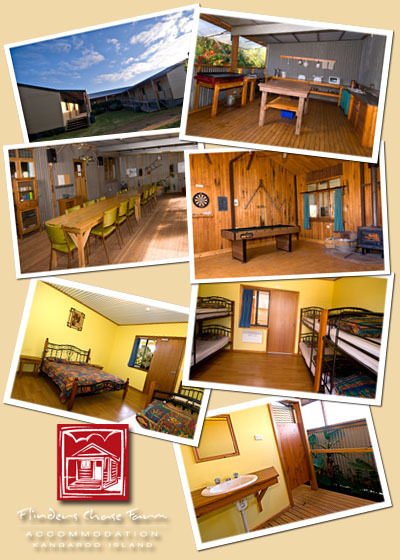 Karatta Ensuite Lodge – Comfortable modern accommodation on Kangaroo Island in a pleasant garden setting complete with outside campfire. A range of room styles and layouts to suit couples, families, and larger groups. Shared rustic living/lounge area – slow combustion wood fire for heating. We provide no catering – You will need to provide your own food. There is no local shopping on the west end of Kangaroo Island, or near the farm. Flinders Chase Cafe has cafe style meals & take away food & park entrance is only about 10km, which is about 15 minutes by vehicle. Hanson Bay Sanctuary has a “Visitor Centre” that includes a Cafe with a range of food styles ideal for lunch. Parndana is the nearest town for fuel, supermarket, post office, bakery, hotel, ice, etc, and is 49km away – About 35 minutes in a vehicle. Phone Coverage: Mobile phones with Telstra Next G /3G /4G sims work. Any other sim card or mobile phone does not have good coverage.